i'm having a lot of crash with directory opus 12.13.
the "quick fix" was not working so i did the procedure with debugview. it's doing this by rick clicking on a .Mid file (midifile), or .Mp3 (must try other files). It does it on Network Drive (Nas) or normal internal HD or SSD. Sometimes it crash by launching a software in the context menu, or directly by opening the context menu before displaying the menu. here is the report given by debugview done with the "quick fix" option enabled. test done on normal Hard Drive + rick clicking on a .Mid file, wav file, mp3 (it seems to be ok on mp4 file, .bak, .veg (trying a few). Are any crash dump files created? so will do a manual dump, must i do it before or after re-creating the crash ? Did the crash happen when those logs were generated? They wouldn't usually complete if there was a crash while the menu was being populated. A manually created crash dump probably won't reveal anything, unfortunately. What's the exact crash message? Could you post a screenshot of it? Is the viewer pane open when you right-click the file? Try closing it first, if so, to see if that makes a difference. as the dump have been made manually, no unfortunatly not, the dump have been made before and after the crash, no idea how i can make a manual dump while making the crash. is there a way to force the automatic crash dump to work ? there is no crash message. opus close immediatly, or sometimes wait maybe a 1/2 or less second and close, and usually rerun, and sometimes, don't re reun..
no the viewer panel doesn't open, i never use it. i use my own picture viewer (fastone), own video player (MPC-BE), own mp3 player (resonic beta player), own editor (notepad or notepad++). 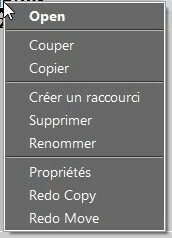 I add that sometimes, (just one second ago), the context menu sometimes open when i right click on a file which crash opus all the time, and then close just after. it just happened, directory opus closed and relaunched himself immediatly. i don't remember if the crash happened in the last beta before the 12.3 but what is sure, is that it's a very recent issue. The video idea might be useful so we can see exactly what's happening. Could you zip up one of the midi files that it happens with so we can test with the same file? video sent via private message, thanks again for everything ! Many thanks for the excellent videos! I've tried right-clicking the same files on a couple of machines without any issues, so my guess is there's something 3rd party involved, or something in your config. Trying the config is something we can do easily, so let's look at that first. The context menu looks like it has some custom items in it. Maybe one of those is triggering a bug when these file types are right-clicked. In Opus, go to Settings > File Types. 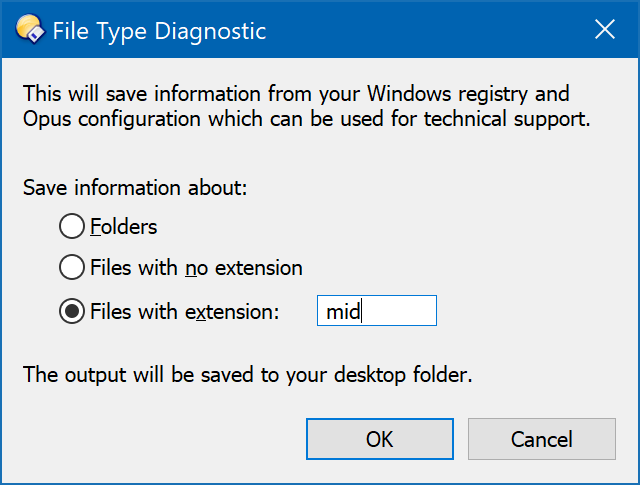 At the top-left of the dialog, open the File menu and choose Diagnostic. Type the extension and click OK.
That will place a zip file on your desktop with the file type info about that file, including any custom context menu items added in Opus. Could you do that for the mid and mp3 extensions and send us the two zips? If you want to, a config backup might also be worth a try (Settings > Backup & Restore). Note that (unlike the file type diagonostic), the config backup will include things like FTP passwords and recently accessed paths. You can rename the extension to .zip to look inside it and edit/delete anything you don't want to send us. The FTP sites shouldn't be relevant so deleting ConfigFiles/ftp.ocx and ftpdef.oxc from the zip is a quick way to deal with those. Of course, please send that via private message if you want to sent it at all, just in case there's anything sensitive still in the file. Very neat script! I love the example gif. i never used it except the day i installed it, it stayed there since then. i'm trying to remove it to see if it's what crash the files. i removed it from the list of script in parameters, but it didn't changed anything but it's still there in the menu visually, i'll try to remove it (don't remember how to do it lol, must read again the topic about it) and if it still crash, i'll follow your advice. i'm a bit worried about all the personnal info, so i'll investigate the file before sending them to you in private message. thanks for the help ! Hi again, just sent you 3 messages, including the requested file (file type + backup file, hope it will be of any help ;). Many thanks for the file type details and config backup. I tried with your config and still don't get a crash. Whatever is happening is quite strange. Would it be possible to generate a Process Monitor log of the time leading up to and just after the crash? A log with both registry + filesystem (the first two icons shown in that post's example) turned on might reveal what's happening at the time of the crash, and which components or code within Opus is involved. Hi leo, thanks to have taken the time to investigate. as said in my PM, i can't reproduce anymore since yesterday night the crash... but i did 4 things yesterday before sending you the files. i removed the redo script but you certainly noticed that there are still some code present in the config file i saw it when i reviewed each file for personnal information. so i'll wait until i can reproduce again the crash (maybe it's gone forever ?) , but yes, i confirm that the issue started to be there when i installed the 12.13 ! good luck, and i'll come back as soon as the crash will be back and will do what you ask ! thanks for everything ! OK, thank you! Maybe it was caused by something else that's now fixed. If not, and it comes back, let us know. There are a couple of other things that may be worth trying in that eventuality, and (for the issue in the other thread) we're currently going through all the code-changes in these versions to work out more tests to run or potential causes. Whether it was something else & now fixed or just not happening temporarily and comes back, many thanks for your time and help investigating this! crash is back so i'll follow your precedure, will do it tomorrw , thanks !! does this help ? just noticed the release of the 12.14 don't know if i must try ? lol. (at worst i can re install the 12.12), i hope a solution will be find, don't want to stay blocked at the 12.12 (impatient for a DO 13 release if it's planned soon ). Is it definitely 12.12 that fixes things and not something else... e.g. the 12.12 installer requires a reboot while the beta installers don't, so if the problem only happens after the machine is on for a while it might not show up for a while with the 12.12 installer? at first, i was on 12.13 = crash almost all the time. i install 12.4 = crash, 12.3 .2 .1 , crash, then i install (always without any reboot) 12.12 = no more crash. ahah.. i confirm the crash is back with 12.14... (immediatly just by right clicking on my beloved .mid file. i can if you want make a full video showing all this. Have any of the versions managed to generate a crash dump since you started trying them? I'll have another look tomorrow at changes between 12.12 and 12.12.1 to see if anything looks like it might be involved.